A high tech game that mixes classic strategy with lasers. This two-player game combines spatial and strategic thinking with the high tech fun of laser beams. Players take turns moving their pieces around the board, and at the end of each turn, fire beams from their lasers. The laser bounces mirror to mirror and when it strikes the non-mirrored side of any piece, that piece is eliminated from play. The game includes 26 playing pieces, 2 lasers, and comes with batteries. Practice logic and spatial relations in friendly competition. 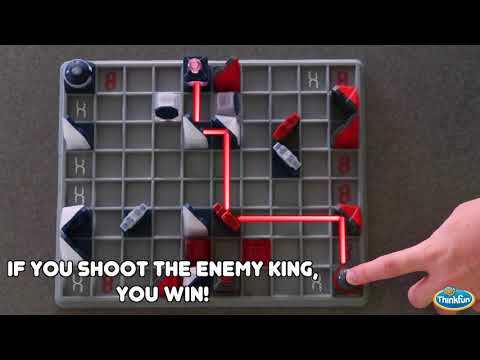 Use your ultimate strategy to illuminate your opponent’s king and become Laser Chess master!